Château Feely is not your typical vineyard in Dordogne, France. We visited to find out why organic, biodynamic wines are so important and taste so good. 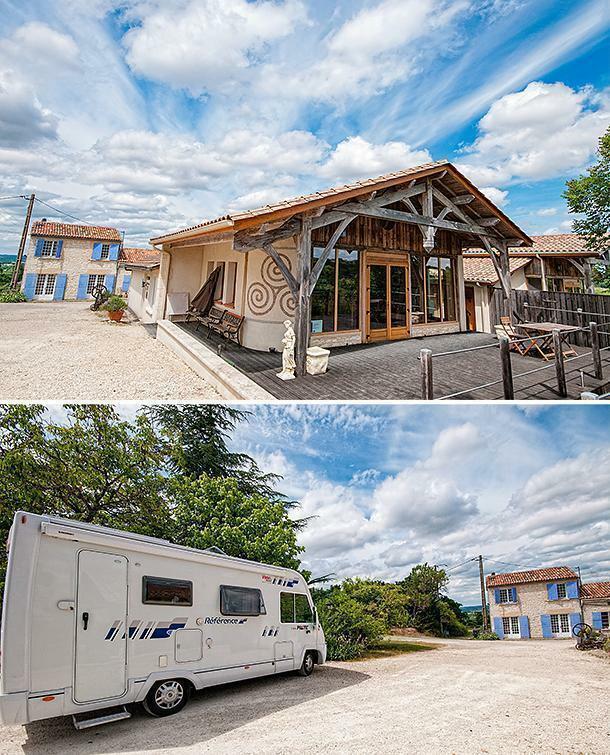 As our motorhome, Amelia, zipped through the vineyards of the Saussignac appellation, we became even more smitten with France’s Dordogne department. Although still in Aquitaine, which we’ve loved for years, this hilly, green, corner of the region is completely different from the Pyrénées-Atlantiques we were accustomed to. As we parked Amelia under a shady tree and climbed out, the large, Celtic-inspired Chateau Feely logo painted on the wall of the tasting room should have been our first tip-off all was not quite as français as we expected. Caroline, as my press agenda stated, was actually Caro and as she greeted us warmly, we couldn’t quite put our fingers on her accent – but it was definitely not French. After a month en français, we welcomed the brain break. Chateau Feely’s bright and welcoming wine tasting room. As Caro lead us into the bright, modern tasting room, we learned why her accent was so hard to identify. Although both Caro and her husband Seán have Irish roots, they met in South Africa, where they both worked in the wine industry. 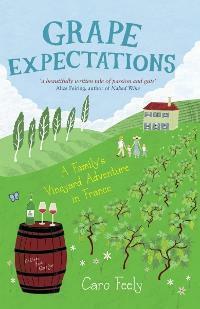 From there, they moved to Ireland and, almost immediately, decided to pursue their dream of living and growing wine, in France. They discovered the rambling, run-down (at the time) Chateau Haut Garrigue, and fell in love with the property and its wines. But all was not la vie en rose and life as French vineyard owners was an endless slog of paperwork, repairs, and learning on the fly. Especially as Seán and Caro didn’t want to grow just any wine; they wanted to grow organic, biodynamic wine – something virtually unheard of, in France, at the time. 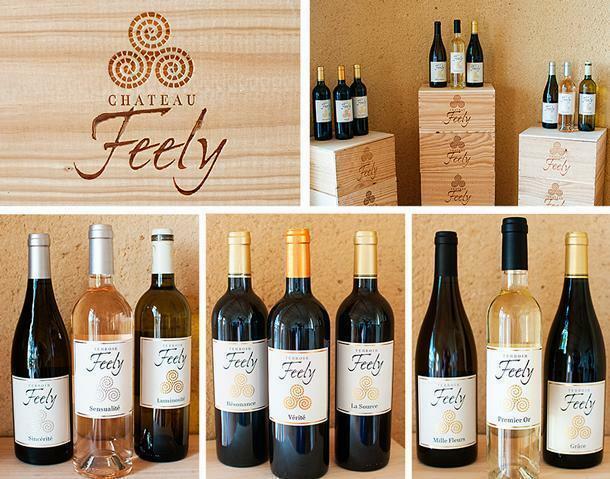 Fast forward to 2015 and it’s difficult to believe Château Feely wasn’t a raging success from the get-go. The main house, dating from 1737 (with some walls traceable to 700 AD) is beautifully restored. 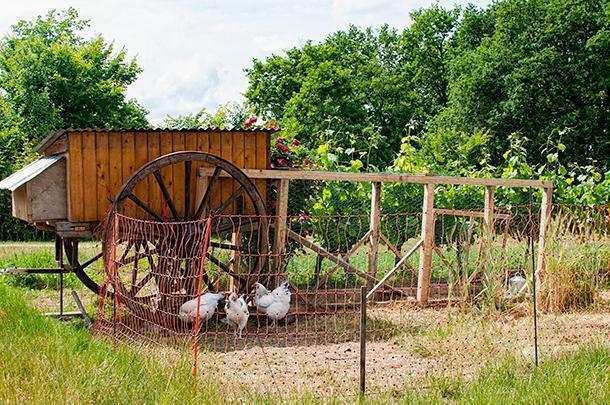 The gardens are well manicured, right down to the charming portable chicken coop, and the tasting room and gite, although modern, sit seamlessly into the landscape. 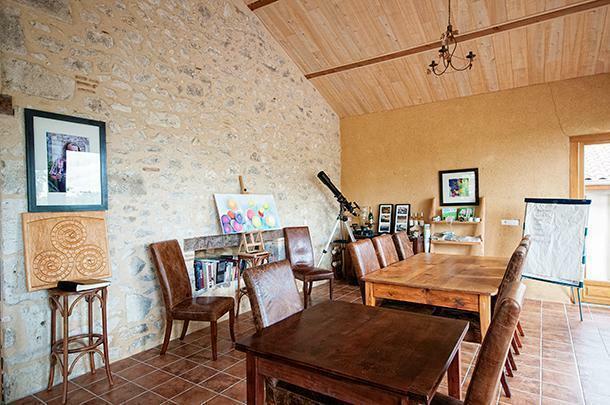 Chateau Feely’s gites are beautiful accommodations in Dordogne and just look at that view! But as much as would have loved to crawl into the cosy gite, lock the door, and never leave, we weren’t here for a relaxing getaway. We came to Château Feely to learn about biodynamic wine, why choosing organic wine is so important, and, of course, to taste the fruits of the Feelys’ labours. In short, in addition to working with organic pesticides and fertilisers, Biodynamics is a holistic wine-growing method of working in harmony with the calendar. The cycles of the moon, earth, and planets dictate the best times to do things in the garden. These cycles can even effect how the wine tastes on any given day. 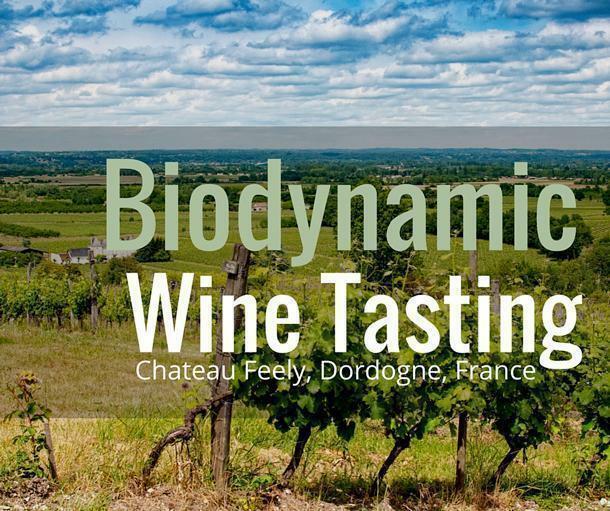 It’s a fascinating process and for a more in-depth discussion, visit the biodynamics section of the Château Feely website. Although we’ve been choosing organic wines whenever possible, we were eager to see how the addition of biodynamics would affect the taste of the Feely wines. With a full range of white, red, rosé, sparkling, and dessert wines, to try, we were excited to get stuck in. We tasted our way through the range, with Caro’s expert guidance, and thoroughly enjoyed every glass. Our firm favourites, however, were two of Château Feely’s sulfite-free wines. Mille Fleurs was one of the most unique wines I’ve ever tasted. It’s a Sémillion white wine that has a pale orange colour. Although it isn’t a sparkling wine, the minerals give it an almost effervescent quality. Our favourite red was a Cabernet Sauvignon / Merlot blend, called La Source. Barrel-aged for 18 months in French oak, it is dark, rich, and spicy. Our visit to Château Feely was much too short, owing to our tight press schedule. If you are in the Saussignac area, you can do a one-hour tasting of 5 wines as we did for only €10pp. However, we strongly recommend a longer stay. Caro offers wine experiences, at Château Feely, that run from half-days to weekends, and include vineyard walks, wine and food pairings, and plenty of wine education. Or, put her extensive wine knowledge to work in the Bordeaux region for 2-5 day wine tours. 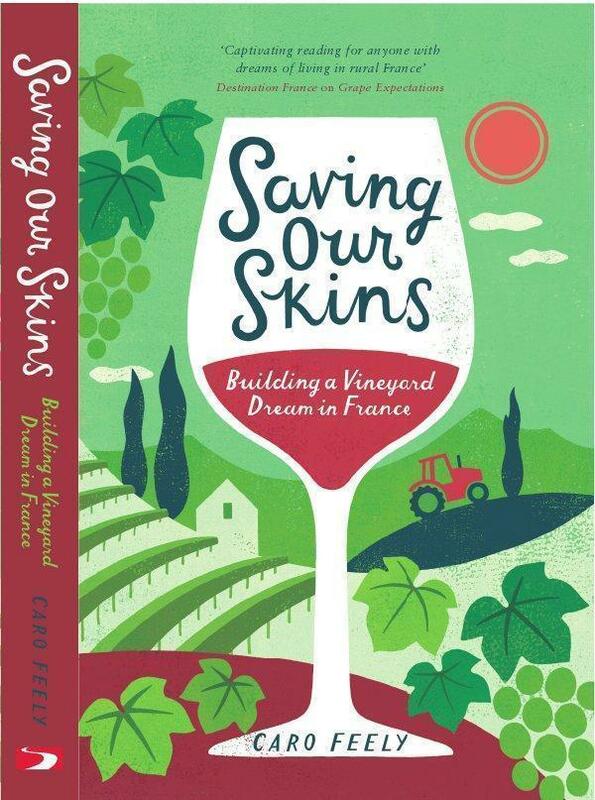 To learn more about Château Feely’s backstory, and how Caro, Sean, and their two daughters relocated to France and rebuilt this unique winery, check out Caro’s books about their journey. 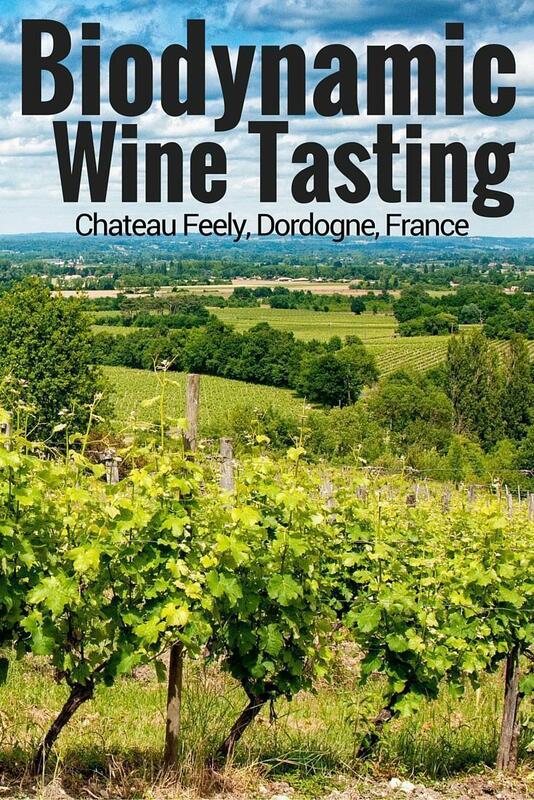 Whether or not you visit Château Feely in person (and you really should) these unique and delicious biodynamic wines should be on every wine-lover’s list. We’d like to thank our hostess, Caro, for an incredible wine tasting experience. We’d also like to thank the Comité Départemental du Tourisme Dordogne for hosting us in the area. As always, all opinions are our own.